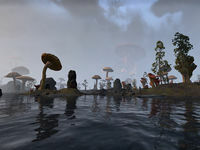 Azura's Coast is the eastern and southeastern coastal region of Vvardenfell. It stretches from Suran on the edge of the Ascadian Isles in the west, past the outpost of Molag Mar on the edge of the Molag Amur region, around to Sadrith Mora in Zafirbel Bay on the east of the island. The region is dotted with Telvanni wizard towers, including Tel Branora, Tel Aruhn, and Tel Fyr. The tower of Tel Mora lies just off the coast from the Grazelands village of Vos. This page was last modified on 19 March 2018, at 05:29.